Amputation. The word makes pet parents nervous, and it’s easy to understand why. There’s the once-unfathomable idea of watching your pet become a “tripod.” And then there are the possible complications that can result from this procedure. Like all surgeries, amputation has risks. They can range from bruising and swelling to fatal blood clots during surgery. The first step you can take toward reducing your pet’s risk of post-amputation surgery problems is by learning how to find the best vet for amputation surgery. Tripawds recently talked about amputation surgery risks with one of our biggest supporters, Dr. Pam Wiltzius of River Road Animal Hospital in Puyallup, Washington. Dr. Wiltzius isn’t just a vet who works with dogs facing amputation surgery, she also has firsthand experience with amputation because her beloved dog Tazzie went through the process herself after being diagnosed with bone cancer. A seroma is an abnormal accumulation of fluid that occurs after amputation surgery. After a leg is removed, body fluids can build up at the area of least possible resistance, the surgical site. Some veterinarians will insert a drainage tube prior to surgery to encourage fluid drainage, some won’t. Before surgery, ask your vet what their preference is. If you notice a large pocket of fluid building up around the incision, accompanied by some dripping, your Tripawd may have a seroma. Seromas can happen after any invasive procedure but are most common with amputation surgeries. Although seromas look terrible, usually they are harmless and can be often be resolved with a pressure bandage and/or draining in the office. If a seroma is present, you’ll see a clear to light pink fluid dripping from the incision area. The fluid is clear, without any cloudiness. The best way to tell if your dog or cat needs an in-office vet visit is to watch how quickly the fluid is dripping. If the fluid is dripping faster than one drop per second, call your vet. Before calling, take note of the color and consistency. If the fluid is viscous or appears as dark to purple in color, your Tripawd may have an infection or an untied blood vessel and your vet should know about this. When infection is present, the bacteria can destroy tissues around the sutures and cause the sutures to come undone. In a worst case scenario, a second surgery will be required to eliminate the diseased tissue and close up the area. Seromas are often linked to excessive activity immediately after surgery. One of the best ways to prevent them is to keep your pet calm, quiet and confined for a few days. Dr Wiltzius also advises using a pressure bandage after surgery. If there is any sign of a seroma, call your veterinarian immediately. Phantom limb pain is another common side effect after amputation surgery. Again, it’s a side effect that can be controlled, and even prevented. Phantom pain happens when a severed nerve “thinks” that the limb is still attached to the body. The nerve is trying to control a limb that doesn’t exist. Phantom pain is a normal complication and many amputee pets get it. Although time is the best thing that can help the severed nerve to heal, you can take steps to alleviate this pain. 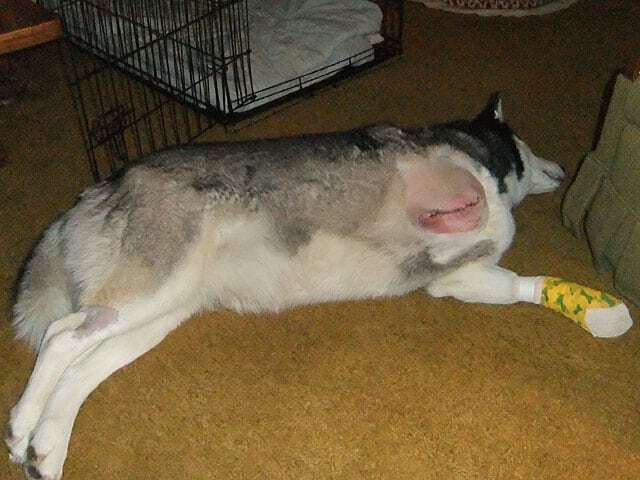 Tripawd Calpurnia’s Mom posted some great phantom limb pain tips here. If you suspect your pet has phantom pain, try a hot/cold pack which can help with generalized inflammation and swelling. For dogs, we like Bella’s Pain Relief Pack because it was made just for a their anatomy. You can also ask your vet about the drug Gabapentin. Many human and animal medical studies have shown that if you start Gabapentin just one day before amputation and continue for a week afterward, it can eliminate or reduce phantom limb pain. Even if your pet doesn’t have Gabapentin prior to surgery, it can still be used post-op. Most pets take two to 3 times daily for best results. This drug is available in generic form, which is far less expensive. Gabapentin is a newer pain relief option in veterinary medicine, and many vets are still unfamiliar with it. If yours doesn’t know about this important drug, ask them to consult with a veterinary pain management specialist from the International Veterinary Academy of Pain Management. Blood clots are the least common post-amputation surgery side effect and very rare. Unfortunately we have seen them happen here at Tripawds, so it’s important to be aware of the risk. “A thrombus is an aggregation of blood factors that may form when the blood flow in the arteries or veins is impeded. It frequently causes vascular obstruction at its site of origin. The thrombus can be classified based on its location and the syndrome it produces (eg, venous thrombosis in large animals associated with prolonged venous catheterization, pulmonary arterial thrombosis associated with heartworm disease in dogs). All or part of a thrombus may break off and be carried through the bloodstream as an embolus that lodges distally at a point of narrowing. Embolization can also occur when foreign material (eg, bacteria, air, fat, catheter piece) is carried into the bloodstream. Thrombi and emboli can be septic or nonseptic. Poor injection or catheterization techniques and inferior catheter material can all result in vascular thrombosis. However, life-threatening vascular thrombosis is more commonly encountered in patients with underlying disease states that result in coagulopathies, such as systemic inflammation, or endotoxemia. . . . Unfortunately blood clots can only be diagnosed when a MRI is performed, and many times they happen before anything can be done about them. Before surgery, talk to your vet about your pet’s risk of blood clots during and after surgery. Many thanks to Dr. Wiltzius for her pawesome perspective on canine amputation and bone cancer. Tune in to Tripawd Talk Sunday! My dog had her rear left leg amputated on Monday and she has swelling in her right front and rear leg. Is that normal? Christine please let your vet know about the swelling. Since we don’t know your dog and we aren’t vets, we can’t give you advice. Usually post-op swelling is just body fluids that are working their way around the body since there’s no leg to go to, but to be safe please call your vet OK? And hop over to our discussion forums so we can better assist you in your journey. We’ll be waiting! My mini schnauzer had his right front leg amputated 9 days ago and he seems to have a twitch, what does this mean? Twitching is a normal sign of the nerves mending. Please visit the forums and blogs for much more help, or download the e-books for fast answers to most common concerns. Start here for help finding the many helpful Tripawds Resources! We strongly suggest you consult with a certified rehab vet/tech for a professional evaluation. The Tripawds Foundation may even reimburse you for your first visit! Post in the forums for much more feedback from members, and start here if you need help navigating the many resources Tripawds has to offer. Best wishes for Digit! With the stitches coming out, it’s time to focus on rehab, core conditioning, weight management, balance work and strengthening exercises. (Walks do not build strength, only stamina.) Please download Loving Life On Three Legs for lots of helpful tips and how to videos, or consider consulting with a certified rehab vet/tech for a professional evaluation and DIY exercises you can do at home. She may even be eligible for reimbursement from the Tripawds Foundation Maggie Moo Fund. Our beloved Rottie, Bodhi, is almost 9 days post-op. He had his front right leg amputated due to pretty serious bone loss from bone cancer. We were completely blindsided by the news he had cancer. We thought it was a sprained ankle because he was only limping a little. I’ve been through a lot of emotion with the amputation and have struggled with knowing if we did the right thing. There was no visible masses in his lungs so we felt like he would have good quality after he healed from his amputation. I’m still not very clear on his life expectancy. I think he is healing well but now he seems to have phantom pains. He has been crying a lot, not wanting to go outside to the bathroom. However he seems to be getting around okay and very affectionate. I noticed his back right leg looks odd when he is hopping along. Maybe it’s hurting? I’m terrified that he is still in some kind of unseen pain. He is really a family member to us and we just are so heartbroken over the whole ordeal. Lindsay I’m sorry to hear about Bodhi. Please come to our Discussion Forums so our whole community can help OK? It does sound like he’s experiencing some kind of pain (affection can sometimes be confused with clinginess, which is a pain indicator). Have you talked to your vet? Or a certified rehab therapist? It would really help Bodhi to have that pain managed so he can get along with loving life. Here’s a post that may help explain why appropriate pain management is so important. Best wishes to you both. Please keep us posted. Our Boxer dog “Rocky” was in an accident and had to have his back leg amputated. The accident happen 8 days ago, and they amputated 6 days ago. He has been at the vet the whole time with us visiting daily. Each day they would tell us he could come home the next day, but each day they would say they needed to keep him and monitor him longer. We went to see him yesterday and they said he had nercosis and they were going good to have to do another surgery and replace some stitches. They called me this morning to tell me my dog had crashed during the night…come to find out they wouldn’t let us see him because they didn’t put a colar on him and he had chewed the stitches out and bleed alot..then they only bandaged it but nothing else and during the night he chewed the bandages off and hit his artery and bled out…. Oh my gosh you guys, we are heartbroken to read this. Please, if there’s anything we can do to support you, let us know OK? You’ve been through so much, our heart goes out to you. Have a 8-10 month old pit/mix named Charlie! He had a bad break when we got him so his front leg had to be amputated. He seems to be healing nice, but what’s seems to be a bruise has formed 3 days after his surgery. Took him.back to the vet thinking maybe something wasn’t tied off correctly but was told not to worry. I guess I can’t help it! It is spreading and I’m still concerned. It doesn’t feel like there is any liquid underneath the skin, but I’m not 100% sure what I’m looking/feeling for. Bruising and swelling are indeed quite normal. 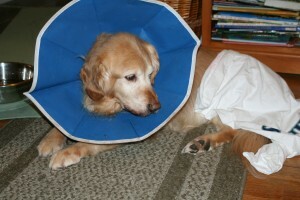 See the Tripawds Galleries for lots of post-op photos to compare. Then start here to get the most help and support from this community! my 3 weeks old puppy broke her leg because it was stuck on their cage so that i will abble to cut her leg. but now it became bloated what are the possible cures that can i apply to her leg? You need to take your dog to a vet ASAP. Please do not let your dog suffer this way. Kaycee is a chihuahua/terrier mix and was rescued 3/26/16. Previously she was hit by a car and Feb 10, had her left hind leg amputated. We have only had her for a few weeks, but the last week, she has become extremely lethargic, sleeps all day and night, does not want to walk or play and occasionally shrieks when picked up. I am getting no tail wagging or excitement when I walk in the door – except to want and lay by my feet. Her appetite is good and bowels are good. I think she is in pain and our Vet put her on Tramadol for pain and Prednisone for anti-inflamatory. Its only been 3 days of meds, but I see no difference in her sad behavior. Is this behavior indicative of pain for a tripawd? Kaycee is so lucky to have you! It does sound like she’s in some kind of pain and I’m not really sure how Pred will help with that, most vets will give a NSAID for anti-inflammatory. I’m not a vet, so take that for what it’s worth. But, I would definitely want her to see a pain management expert. Here’s a blog post that talks about pain management and how to find a good pain management/rehab vet. Best wishes, and please keep us posted in our Forums, we’re here to help. My dog Abby had soft tissue sarcoma last year and had her front right leg amputated. She healed really good but till this day she is always licking where her leg used to be. I was wondering if this is normal or what the signs are that she is doing this. Thank you so much!! Justine that could be a pain indicator of some sort. Take note on when it occurs, how often and for how long, what other symptoms if any are happening (tiredness, lack of appetite, cliniginess, etc) and let your vet know. Oh poor pup. It sounds like she is in pain, I would have her checked out by a vet who understands pain management in Tripawds. Join our Discussion Forums so we can better help you as a community OK? to put your dog down on the suggestion of a vet Forgive me Jack. I miss you every day! Thanks for the comment Tom! So sorry to hear about Jack, but please stop shoulding on yourself. He would not want you to feel so bad. My dog had his front limb amputated 10days ago. About 85% of his wound his healing fast but there is a hole that is open and keeps draining. He is under vet care. He’s taking antibiotics and we apply sulfadine creAm as prescribed. I’m concerned and the vet tells me that it will heal on its own once new healthy skin tissue starts to form but because of the infection he had pre surgery that was septic is what is causing it to drum and not close. I’m skeptical. Has anyone else experienced this? Sorry to hear about you pup, Priscilla! Please post in the forums or search there, where others have shared similar stories in the past and you are likely to receive much more feedback from members! Amanda I’m sorry to hear about your puppy. Since here surgery was only a couple of days ago she’s still in the early phases of recovery so try not to worry. Please visit Jerry’s Required Reading List for answers to your questions and also visit our Discussion Forums where lots of folks are ready to help. Good luck! Finn got his rear leg amputated tuesday. He peed before we took him out of the clinic (thursday), but hasn’t peed since (it’s saturday). Pee pads weren’t working, so we built a ramp so he could go in the front yard, still nothing. There is so much snow/slush/mud here yet so there is a really limited area where he can go. He was used to going in the back yard but there is a lot of snow and muck there and I don’t want him to fall. Do you think he is holding out because he is used to going in the back? I am getting really worried that there is nerve damage or something. Do you have any advice, do you think he will just go when he has to go? Hi guys, I’m so sorry that you’re having difficulties. It’s probably nothing serious but at this point you really should go see your vet asap. Usually a dog just needs help getting things moving to get back to being regular. Please call your vet and then come to our discussion forums and let us know how he’s doing. Good luck! Well we had to get him out moving and take him to a more “private” place for Finn to do his business! What a relief!! Now he has kennel cough and is coughing up white foam. The vet tells me the antibiotics he is on should get rid of that. I pray he pulls through this cold and continues healing from the amputation. My 13 yr.old cocker spaniel has squamous cell carcinoma in his foot the mass was removed 6mos.ago and has returned should I have his leg amputated.I am so afraid because of his age he might die. Hi Louise, we understand your concern. You’ll receive much more advice from members in the discussion forums. Every dog is different, but age doesn’t really matter. If your dog is otherwise fit and healthy, he should do well on three legs. Only you and your vet can make this decision, and while we have heard of it happening, it is very rare for a dog not to survive surgery. You will find plenty of success stories about senior dogs loving life on three legs in the forums.